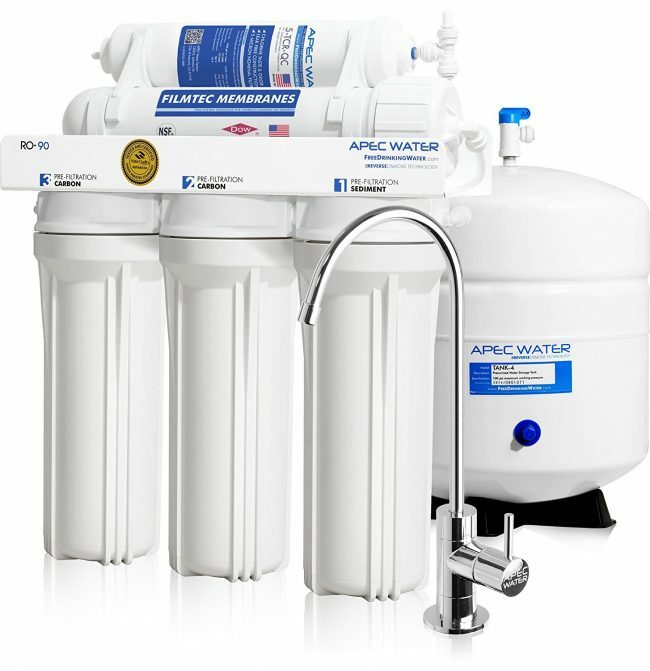 The APEC water ultimate RO-90 GPD drinking water filter system is a 5-stage water filtration system. Now you may be feeling apprehensive because a lot of other water filtration systems use 7-stages. Let’s find out how the APEC stands up to its predecessors. So, this model is a WQA gold seal certified system and basically that means it’s certified to provide you with safe, clean and pure drinking water. First the water passes through a high grade 5 micron 10 inch super capacity polypropylene sediment filter that removes big particles like dust and rust, this step also helps with the longevity of your overall system and its membrane. Stage 2 removes chemicals such as chlorine, and VOCs and also gets rid of any cloudiness, unpleasant odors, or strange tastes through a premium extruded super capacity 5 micron 10 inch carbon block. Stage 3 is similar to stage 2 in that it also uses a super capacity premium extruded carbon block that continues to remove any more odor, taste, or chemicals that may be lingering in the water. Step 4 removes up to 99% of any dissolved solids, bacteria, or contaminants such as heavy metals, arsenic, fluoride and more, through the Top tier FILMTEC RO membrane, which is of very high quality. 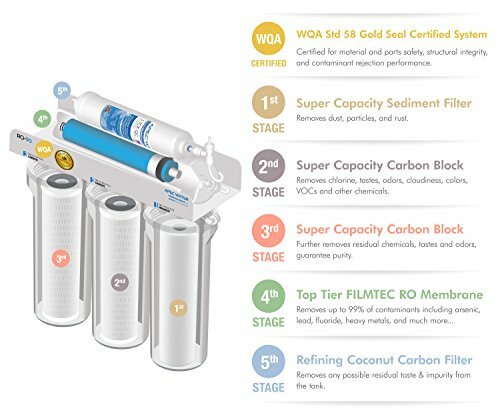 Lastly stage 5 uses an advanced coconut shell refining 10 inch carbon filter to do a total contamination removal that eliminates any possible residual taste and impurities from the tank. So basically, your water gets a super deep, squeaky clean, CLEAN. They use carbon block filters to make sure all the contaminants and chemicals are removed and absorbed, providing you with clean pure water. Included in kit is a 100% lead free chrome faucet and all the tubing is food grade as to keep the water extra clean and ultra-pure. 1 year satisfaction guarantee is included with every purchase and comes with free support from WQA certified water specialists that are available to help & support you throughout the entire use of this product. Step by step installation videos are also available. System is 25 lbs. and measures 15 X 7 X 18 inches so should be perfect size to fit under most counter sinks. The versatile feed water adapter allows either ⅜ in or ½ in connections without needing any extra components or pieces which does fit most undercounter feed water lines. Specs: storage tank is 4 gallons and measures 11 X 11 X 15 inches. Feed water pressure is 40-85 psi, and feed water temp is 40-100 degrees F, and feed water pH is 2.0 to 11.0. Max dissolved solids is 2000 ppm. Included with kit: filter set, FILMTEC RO membrane and fittings, 4 gallon holding tank, standard chrome faucet, John Quest quick connect fittings, stainless steel check valve, food grade tubing, and instruction booklet. 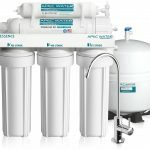 This APEC water ultimate RO-90 GPD drinking water filter system seems to be pretty straight forward, easy to use, install and could be a great option for your home. Even though it only uses 5 stages compared to its 7 stage competitors, it seems the RO-90 does just as good of a job. APEC also can provide a list of contaminants that their system removes to prove its effectiveness. The system is WQA gold seal certified to ensure a quality product that produces clean and safe water. They use high end carbon block filters, along with a high quality polypropylene filter and top tier FILMTEC RO filter. Although please note that there is no remineralization process with this system so if that's something that is important to you in a water filter than this probably won't be the best option for your home. WQA gold seal certified which ensures the product's performance, durability, and that it will provide safe clean water for you to use. The super capacity filters lasts about twice as long as standard filters which means less filter changes and less out of pocket costs for you. System is made by a trusted top tier brand, APEC, and made in the U.S. This manufacturer inspects, builds and lab tests every system for 8 hours to make sure their product is up to quality standards before shipping. System is guaranteed to be free from water leaks, bursts, and noises. Has the option to add upgrades such as an ice maker kit, 14 gallon tank for larger homes, water quality testing meter, or even a UV light. Easy and quick to install because it is equipped with John Quest quick connection fittings and tubes which also makes future maintenance a breeze. 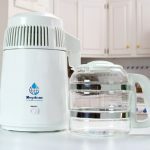 While this system is not the most expensive water filter out there, it is on the higher than average side of cost so take that into consideration. There is no remineralization process in this water filter system so you may be missing out on some key minerals, like calcium and magnesium, with this system.